I can't believe that Thanksgiving is next week! Where does the time go? Whether you're hosting the feast or visiting family, here's a simple yet elegant outfit idea. 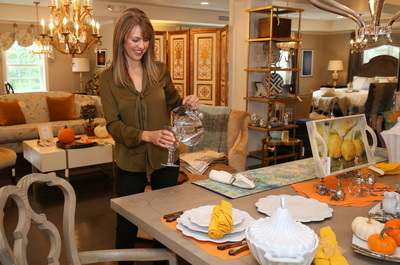 Setting the table at Gianna Interiors (no, my table never looks this good in real life!) 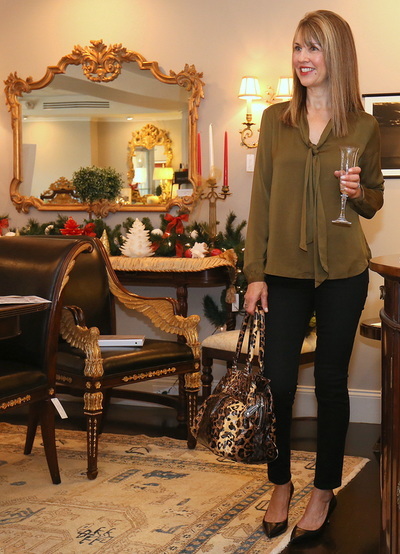 wearing an olive silk tie front blouse and 7 for All Mankind slim illusion high-waisted black jeans. These stretchy jeans expand exceptionally well to accommodate overeating, which I plan to do a lot of. I love the feminine detail of this blouse. Yes, you can "tie it in a knot or tie it in a bow", but I prefer to let the pieces hang. It's not as "prim and proper" this way and maybe even a bit sexier. 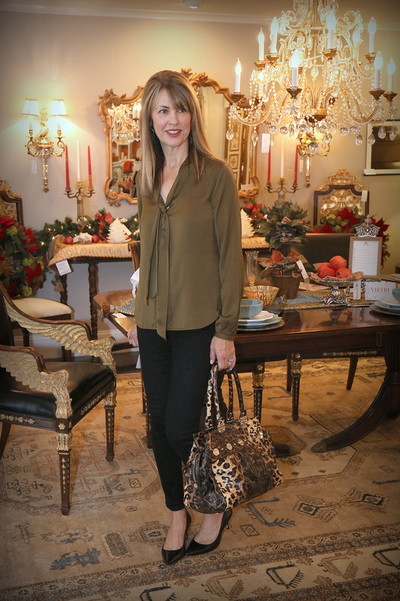 I paired this outfit with comfy black pumps and a fabulous animal print patent leather bag. My bag was a boutique find --similar here. Notice the beautiful Christmas decorations in the background. Just FIVE more shopping weekends until the big day! Scary isn't it? Earrings by Luxa Jewelry. I love their unique chandeliers because they're very lightweight and don't pull on my earlobes. 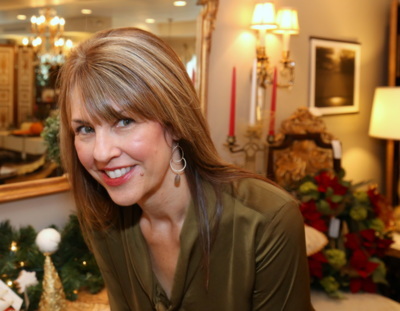 Thanks to Gianna Interiors for letting us shoot in their beautiful space. Also a huge thank you to my photographer/bestie Cathleen Trainor.